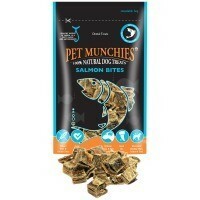 Pet Munchies Salmon Bites Dog Treats are 100% natural gourmet treats made from only the finest quality natural wild salmon. A rich source of vitamins and minerals to support good health, the treats are low in fat, high in protein and completely free from all artificial additives, preservatives, flavours and colours. The small size of the bites make them suitable for any size dog, while the rough, durable texture encourages chewing and helps to remove plaque and tartar from your dog’s teeth. Pet Munchies Salmon Bites are also full of Omega 3 & 6 fatty acids and antioxidants to help keep your dog’s skin healthy and their coat glossy and shiny.